Aluminum Foil Embossing Machine / Paper Embossing Machine Video(FEM) - HCI Converting Equipment Co., Ltd. Designed for surface embossing on beer labels, aluminum foil for tobacco packaging, various beverage labels, book cover, envelops, invitation cards, congratulatory cards, packaging paper boxes. 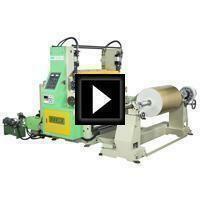 The Foil /Paper Embossing Machine will upgrade outlook effect and product quality level. Applicable packaging materials include paper laminate, metalized paper, aluminum foil / paper, composite film etc. The surface Embossing Machine not only provides attractive beauty, but also greatly increases visual effect.